The shoulder is a ball-and-socket joint that allows the arms to be raised, twisted, bent, and moved forward, to the side and backward. The head of the upper arm bone (humerus) is the ball, and a circular cavity (glenoid) in the shoulder blade (scapula) is the socket. A soft-tissue rim (labrum) surrounds and deepens the socket. The head of the humerus is also covered with a smooth, tough tissue (articular cartilage); and the joint, also called the acromioclavicular (AC) joint, has a thin inner lining (synovium) that facilitates movement while surrounding muscles and tendons provide stability and support. Charcot's arthropathy. Also called neuropathic arthropathy or arthritis, Charcot's arthropathy is a condition in which the shoulder joint is destroyed following loss of its nerve supply. Shoulder joint replacement surgery can either replace the entire AC joint, in which case it is referred to as total shoulder joint replacement or total shoulder arthroplasty ; or replace only the head of the humerus, in which case the procedure is called a hemiarthroplasty. The treating physician usually performs a general medical evaluation several weeks before shoulder joint replacement surgery to assess the patient's general health condition and risk for anesthesia. The results of this examination are forwarded to the orthopedic surgeon, along with a surgical clearance. Patients are advised to eat properly and take a daily iron supplement some weeks before surgery. Several types of tests are usually required, including blood tests, a cardiogram, a urine sample, and a chest x ray . Patients may be required to stop taking certain medications until surgery is over. A careful and well-planned rehabilitation program is very important for the successful outcome of a shoulder joint replacement. It should start no later than the first postoperative day. A physical therapist usually starts the patient with gentle, passive-assisted range of motion exercises. Before the patient leaves the hospital (usually two or three days after surgery), the therapist provides instruction on the use of a pulley device to help bend and extend the operated arm. The surgeon's ability to reconstruct the shoulder's supporting tissues, namely the shoulder ligaments, capsule, and muscle attachments. The patient's preoperative muscle strength. The patient's motivation and compliance in participating in postoperative rehabilitation therapy. Arthritis treatment is very complex, as it depends on the type of arthritis and the severity of symptoms. Alternatives to joint replacement may include medications and therapy. It is known that arthritis is characterized by an increased rate of cartilage degradation and a decreased rate of cartilage production. An experimental therapy featuring the use of such joint supplements as glucosamine and chondroitin is being investigated for its effectiveness to repair cartilage. The pain and inflammation resulting from arthritis are also commonly treated with nonsteroidal anti-inflammatory pain medication (NSAIDs) or cortisone injections (steroidal). See also Shoulder resection arthroplasty . Godeneche, A., et al. "Prosthetic Replacement in the Treatment of Osteoarthritis of the Shoulder: Early Results of 268 Cases." Journal of Shoulder and Elbow Surgery 11 (January–February 2002): 11–18. Miller, S. L., Y. Hazrati, S. Klepps, A. Chiang, and E. L. Flatow. "Loss of Subscapularis Function after Total Shoulder Replacement: A Seldom Recognized Problem." Journal of Shoulder and Elbow Surgery 12 (January–February 2003): 517–521. Roos, E. M. "Effectiveness and Practice Variation of Rehabilitation after Joint Replacement." Current Opinions in Rheumatology 15 (March 2003): 160–162. Steinmann, S. P., and R. H. Cofield. "Bone Grafting for Glenoid Deficiency in Total Shoulder Replacement." Journal of Shoulder and Elbow Surgery, 9 (September–October 2000): 361–367. Vitale, M. G., et al. 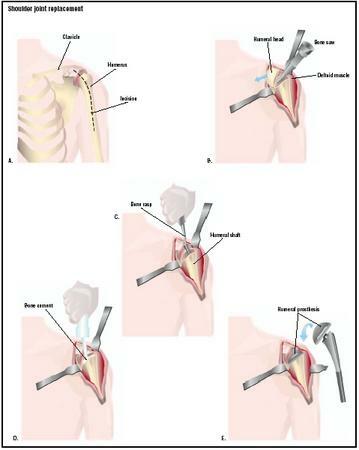 "Geographic Variations in the Rates of Operative Procedures Involving the Shoulder, Including Total Shoulder Replacement, Humeral Head Replacement, and Rotator Cuff Repair." Journal of Bone and Joint Surgery, 81 (June 1999): 763–772. American Academy of Orthopaedic Surgeons (AAOS). 6300 North River Road, Rosemont, Illinois 60018-4262. (847) 823-7186. http://www.aaos.org . Getting a Shoulder Replacement. http://www.jointreplacement.com/xq/ASP.default/mn.local/pg.cat/joint_id.1/cat_id.6/newFont.2/joint_nm.Shoulder/local_id.8/qx/default.htm . "A Patient's Guide to Artificial Shoulder Replacement." Medical MultiMedia. http://www.medicalmultimediagroup.com/pated/joints/shoulder/shoulder_replacement.html . Your site is thought provoking. Great job. Where can I find rating/or number of surgeries orthopaedic surgeons preform annually? I had shoulder joint replacement a couple of weeks ago and experienced an unexpected complication: when I awoke from surgery, I had no feeling in my right foot, and my right leg and ankle were numb. My doctor thinks that there was some impingement of the sciatic nerve during my 4-hour surgery, due to my positioning on the table. I have begun recovering some of the feeling in my foot, but my leg and ankle are weak and my foot is still partially paralyzed. I am receiving PT and have to use a hemi walker to get around. I can't find any specific information regarding such a complication from this surgery. I agree with Trish, I live in central Penna., where can I find ratings on surgens who do shoulder's and the number of surgeries they do yearly? young and would like it repaired Our home is in Sun City West Az. My fiance is a war veteran he had to have surgery on his shoulder for a gun shot wound. Now his shoulder joint is deteriorating he is afraid that he will have to lose his whole arm now. Could he be a good candidate for a shoulder replacement? i had a replacement ball in my left shoulder 11 years ago and a replacement ball in my right shoulder 6 years ago,i am now 63 and both my shoulders are so painful and my hands go to sleep regularly.Doe,s anyone have the same problem,or does anyone know the reasons for my agonies?